President of the science club, buxom blonde of the senior class, and the focus of all the male gazes in the school, Yayoi Bernard Lutwidge is the undisputed Queen of Suikyou Academy… At least that’s what she could be if she showed a little more of her true self when in public. Instead, she’s the perfect, caring sempai, the soft spoken, half-British angel of the senior class, and the only person, other than Saki, that seems to be able to stand being around Tohru Naito. For Tohru, she’s the only person among what few friends he has that knows the full gravity of his illness and doesn’t push him away. Sure, being around her means being forced to help her with everything, she did all but blackmail him into joining the science club, after all, but she at least respects his space and is willing to lend an ear or hand when he needs it… especially when it comes to prescription strength sleeping pills. As annoying and otherwise antithetical to leading a quiet, peaceful life as being around Yayoi can be, there’s something about her “true” self that bothers Tohru. While she maintains the honor student facade to everyone from teachers to her own classmates, around Tohru, she has never once tried to pretend to be anything but the silly, teasing sempai around him. As much as he’s come to accept being led around by her, it feels more like she needs him more than he needs her. 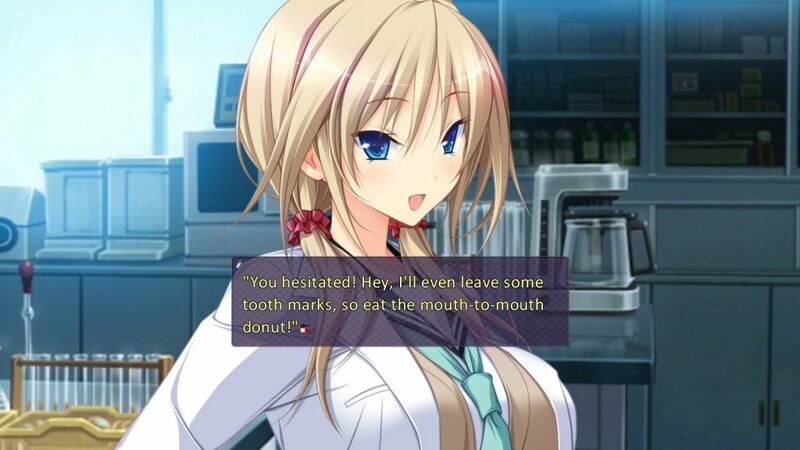 Hapymaher is currently available at MangaGamer.com, so be sure to grab your copy today and join us in this sweet nightmare. Tagged hapymaher, purple software, Purplesoft. « Umineko Answer Arcs Physical Edition –– On Sale Now! Please consider releasing Hapymaher on Steam. Even if you released a paid patch here. I know you might have reservations and I understand why, but regional pricing is necessary for many of us. It wouldn’t be possible to put Hapymaher on Steam. The H-content in Hapymaher is far too interwoven into the story to be able to remove it without glaring gaps in the story. I am a bit curious as to how lenient Steam will be once its content filtering tools are set up. I wouldn’t expect Euphoria, but maybe something like the 18+ version of Da Capo III would be okay. I’m the type of person who would buy it on MG regardless, but there will be a substantial market for 18+ games on Steam if Steam allows it. Gotta sell really well for the higher ups to consider the fan disk, so go tell all your friends!